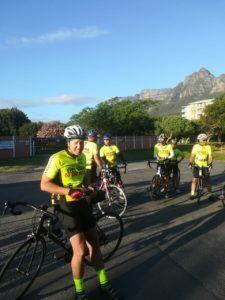 Our road social rides take place every Saturday morning at 06h30 from the PPA office at 9 Hill Park Lane, Mowbray. The ride is free of charge and open to everyone including non-members. The riders are split up into groups according to their strengths. The various groups stay together as there are catch up stops for each group. A support vehicle with spares will follow the slowest group doing the shortest distance. No one is left behind. The route is decided on the day depending on the number and strengths of the riders and the weather. The rides are 3+ hours long depending on the route which will include some climbs and will be 50 km or more. You are free to shorten your ride but there will be no support except for fellow cyclists who may join you. The faster group will ride a longer unsupported distance. After the ride, a free cup of coffee or cool drink awaits you at The Gear Change, Durban Road, Mowbray.